Maserati Granturismo MC Stradale driven | What Car? 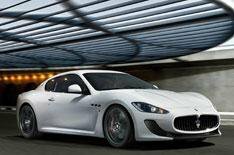 This is Maserati's most expensive model a range-topping, sportier version of its Granturismo S coupe. It features a range of cosmetic and mechanical upgrades, inspired by Maserati's Granturismo MC Trofeo and GT4 race-cars. On the outside, there are aggressive new front and rear bumpers, with dramatic aerodynamic tweaks to improve downforce. There's a subtle bootlid spoiler, too, as well as bespoke bonnet, sills and alloy wheels. In all, it looks meaner and more focused than the standard car, but no less handsome. Inside, there are two seats rather than four and they're made of cabon-fibre, to help reduce weight. The upgraded exhaust system, ceramic brakes and alloy wheels are lighter, too. Overall, the MC Stradale weighs 110kg less than the Granturismo S.
It might have the looks, but this is no raw, highly-strung racer. Maserati has been careful to ensure that the MC Stradale is every bit as civilised as any other Granturismo. It's very easy to drive, rides comfortably and, when you want it to be, it's quiet. When you're in the mood, however, the MC Stradale performs the role of snarling sportscar very well. The noise that you do hear and which dominates the driving experience is the intoxicating bellow of the 4.7-litre V8 engine. It's a tweaked version of the one used in the Granturismo S; power is up by 9bhp to 443bhp and there's an extra 15 lb ft of torque, fed to the rear wheels through an updated semi-automatic gearbox that has three modes: Automatic, Sport and a new Race mode. It's the latter that really brings home the difference between the two cars, providing incredibly rapid shifts and allowing the engine to rev harder, so you hear more of that sensational noise. The MC Stradale is quicker, too, with an official 0-62mph cut by 0.3 seconds to 4.6 seconds. The uprated brakes help to reign in the power, while lowered, stiffened suspension and special tyres help improve grip and handling. The changes are enough to make the MC Stradale Maserati's most convincing sports car for a long time. It's effortless to drive, but the MC Stradale has a well-balanced, responsive feel that makes it very satisfying on demanding, twisty roads. You don't forget that it's a big car, but the MC Stradale is impressively eager to change direction and the steering is precise and communicative. Apart from the racy seats and the empty space behind them the MC Stradale's cabin is much like any Granturismo's. There are some different materials, however and, for those that intend to take their car to the track, the option of a roll cage and four-point racing harness. The comfortable driving position and good visibility make it very easy to live with and there's an appealingly quirky, hand-crafted feel overall. If some of the switchgear is a bit dated and rather too similar to that in Fiat models of old, it's largely outweighed by the quality of the materials and finish elsewhere. At £109,995 the MC Stradale is in similar price territory to the Mercedes CL63 AMG and Porsche 911 GT3RS. That's £17,635 more than the S. Most buyers are likely to spend more, dipping into the extensive range of personalisation options, with myriad of exotically named choices for the interior trim, exterior paintwork and even brake pad colours.